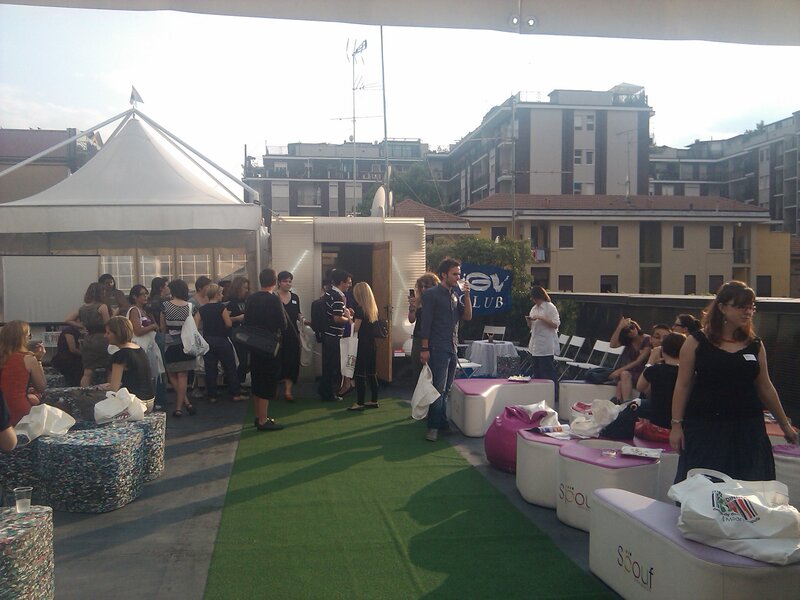 Last Friday, 1st of July, it was the last session of Girl Geek Dinners Milano and I attended of course. It was my second time here in Milan after I first became a “girl geek” in Brussels where I used to attend the EU Geek Girls nights. Even though I never wrote a post about the event before, I thought this time would be interesting to follow how girl geeks change from place to another and to compare different formats of the international event. For all ungeeky readers (if at all…) and those who never heart about GGD event, have a look here. Basically it’s a networking event created from a girl in London who got annoyed and frustrated about being one of the only females attending technical events. I have to say I was utterly impressed by the volume of preparation, sponsors and gadget give-aways here. The event has been always organised professionally even though is all voluntary work of couple of girls – Sharon, Marinella, Barbara, Ilaria, Emma and Morena. One significant difference here is that actually boy geeks are allowed. I am not sure about this one. Of course, me too, got tempted to take my boyfriend with me but then all the networking and girly thing is going on waste…isn’t it. But what makes a dinner a girl geek dinner? The gadget of course, and the presentations of smart girls who made it in the geek world giving some useful insights on all new interesting stuff. This time the gadgets really rocked, a true geek joy. At the entrance I was given a big super green bag (it was actually white but made from 6 plastic bottles!) with the logo of “Gilr Geek Dinners Milano”, filled in with the Gadgets: a pre-sale trial of the new security system for Android by Norton – Norton Mobile Security, super pretty multiply usb coupler again by Norton, an elegant glass-made necklace and a small but very useful gadget for smartphones (Norton): a screen cleaner that sticks on the back of your phone when you don’t need it. And if this wasn’t enough, there was a Twitter and Facebook game with more gifts for the winners, which of course I couldn’t allow my geek self not to win. 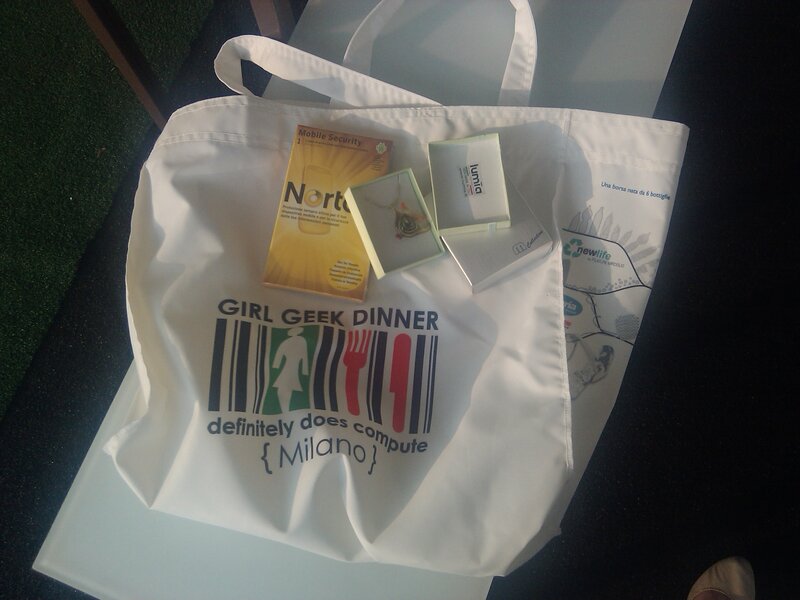 It’s worth noting that last girl geek dinner Milan gadgets were awesome too: business cards’ holder with the logo of GGD Milano, a t-shirt and a book! Thank you GGD Milano, you are really spoiling us. At the end I hope that all this interest from sponsors and various companies will grow a big and strong girl geek community in Milan, which is yet humble and manly populated with experienced professionals who decided to follow the trend and change their field of occupation. I would enjoy seeing more digital natives and passionate girls about digital communications and social strategies next time. I can’t wait… till October. I am sorry the post is in English, but it will take me double the time to write it in comprehensible Italian. Maybe I will make a resume later.